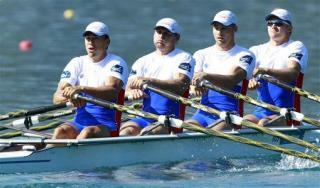 (Newser) – World rowing's ruling body says that the Russian men's quadruple sculls team has been disqualified from the Rio de Janeiro Olympics for a doping violation, and will be replaced at the games by New Zealand, the AP reports. The World Rowing Federation says that trimetazidine, a banned substance, was found in a urine sample given by rower Sergei Fedorovtsev in an out of competition test on May 17. He competed a week later at the final Olympic qualifying regatta in Switzerland, where Russia initially qualified for the games and New Zealand placed third. This proves that they have also been getting away with "doping" for a long time and unfortunately, there is no way to back check, and remove all their wins, medals, etc. Their only friends are Cuba, China, No.Korea, etc.Don't expect an apology from Putin but a "spin" on how unfair the IOC has been. They are an" evil empire" who also sells weapons to all the "bad guys." Olympic and pro athletes just don't get it. I'd kill myself if I was that stupid.